A fifteen year old Sri Lankan Tarusha Fernando, playing for Switzerland, shone in Bologna, Italy, when he exhibited a magnificent display of the Willow on the cricket field by massacring European bowlers with fourteen astounding boundaries to score 58 runs before top edging a return catch to the bowler. During the same match, Tarusha captured two wickets for 27 runs in five Overs at the Sixth ICC European under 15 Division, Championship in Bologna, which began on 16 August 2009 where eight European countries, France, Switzerland, Italy, Gibraltar, Isle of Man, Israel, Belgium and Germany participated. On the opening day four matches were played of the 35-Over a side Tournament where all eight countries were to strive for superiority for the prestigious Championship Title. The hosting team Italy, coached by legendary Joe Scuder was expected to be among the favourites. The match providing maximum entertainment for the day was between Switzerland and Israel. Switzerland winning the toss decided to bat first. The openers Tarusha Fernando (15) and James Hadden got off to a rollicking start with a 48 run opening stand in just 2.1 Overs before Hadden was bowled out for 5 runs. Italy winning the toss, batted first and compiled 231 runs in 30.5 Overs. Isle of Man were dismissed for 191 runs in the 35th over. Belgium bundled out Germany for 129 runs in 28.4 and scored the winning target in 12.2 Overs, with a 130 run unbeaten stand between the openers J Aron and F.Mcrae. In the third encounter Gibraltar was beaten by 7 wickets by France. Gibraltar won the toss and decided to bat first and scored 129 runs in 28. 4 Overs. France reached the winning target for the loss of 3 wickets in just 17.4 Overs. On the first day of the Championship Tournament Tarusha Fernando continued to wipe out the bowlers to all parts of the field before top edging a return catch to the bowler. The other batsmen continued on the solid foundation provided to mass 290 runs for the loss of 5 wickets in the allotted 35 Overs. 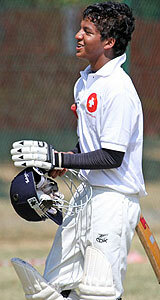 Switzerland registered an empathetic win by 180 runs bundling out Israel for 110 runs in 25.3 Overs. Israel was penalized for their slow over rate where they lost 4 Overs. Tarusha Fernando who studies at present in Switzerland has managed to prove his mettle in the international cricket arena as an all-round performer. .
Tarusha Fernando’s excellent performance (while playing for Switzerland) at a tender age of 15 will no doubt catch the eye of the selectors of the Sri Lankan Cricket Board with a fervent hope of yet another shining star emerging to uplift and maintain the high international standard of Sri Lankan cricket in the future.